And so it goes. Every day/week/month reveals that we are in uncharted waters. TARP funds – Paulson doesn’t want â€˜em â€¦ wait! yes he does , Auto Bailouts, Investment Banking Bailouts, Credit Card companies becoming banks â€¦ â€œThere is no playbookâ€ for what we’re experiencing. – Sales Volume is plummeting. – If you want to sell, price aggressively. Right now (Sunday, 21 December around 10:30 pm), there are 2,377 homes currently on the market in Charlottesville, Albemarle, Fluvanna, Greene, Louisa and Nelson – 3,298 in the entire MLS. There are 321 properties under contract; 465 in the entire MLS – I think â€œpatheticâ€ is the operative word here. – Interest rates are ridiculously low, and loans are absolutely still available. – It is a Buyer’s market (if you didn’t know) – so long as you look to stay for at least four years. If you’re an investor seeking to buy and hold – I expect that buying today will yield significant returns in 20 years. – New Construction continues to be slow – and looks to be for the near future – this is good in that existing inventory will be burned through rather than consistently competing with new homes. – Pretty much everything else. I’m really, really hoping that there is some sort of statistical or data entry anomaly that accounts for the jump from nearly fourteen to nearly eighteen months of inventory. â€¦ We’re following normal trend lines, but this is a bit extreme. It would appear that perhaps we should have been content with eighteen months of inventory. I’m still hoping that there is something wrong with the data. That is what I hope to accomplish with these market reports – to provide context to buyers, sellers, lookers – anyone interested in the real estate market in the Charlottesville region. This information is not presented as a means by which to scare but to provide information. This is a guide, not necessarily a definitive answer, as each sub-region, sub-area, neighborhood and street is it own analysis. Let’s start with the median prices of all properties in the Charlottesville region – Year over year, region-wide, sales volume is down about 25%. Albemarle County volume is down about 33% and the City of Charlottesville is down only 11%. Put simply, sales of single family homes in Albemarle County are down about 25%, the City of Charlottesville is down only about 8.5% and the region is off about 21% year over year. Median prices are down everywhere but Nelson. Days on Market are the same year over year??? Median Sales price is up??? Here’s what feels right to me – The number of transactions closed, listings under contract and new listings. When I manually search for new listings in Charlottesville and Albemarle in November, I get 133 – same as the report. – The information and analysis are only as good as the data available – MLS data is notoriously unreliable (due primarily to those inputting said data) but it’s the best we have. All data comes from the Charlottesville Area Association of Realtors. – This is my year-end report. I don’t foresee a substantial change in the market between now and the start of 2009. If magically that does happen, I’ll revisit this post. – There’s been a lot of fear about resetting ARMs – here’s a thought that I haven’t seen elsewhere and that I hope/plan to flesh out in a later post – maybe resetting ARMS won’t be so bad– what if they were to reset downward rather than up? 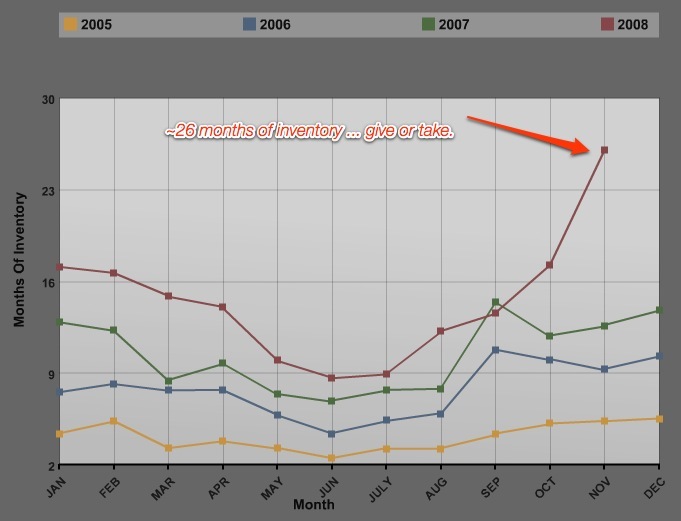 – Shadow Inventory – or … why 26 months might be under-estimating the amount of inventory on the market. – I plan to systematize these market reports and am exploring some partnerships that would greatly enhance what I have been providing here. – More PDF reports in printable formats … I’ll PDF this report and dress it up by the end of this year. – I’d love to be able to start doing land analysis. – If any commercial Realtor in the Charlottesville area wants to join up to start doing market analyses on the commercial real estate market, please let me know. I suspect that the CRE market is going to be big news next year. – A continued commitment to transparency – with the data and analysis as well as who I am and how I work. – More graphs and colors – we all like shiny things, so I’ll do my best to improve the reports. – If there is anything that you would like to see added, changed, etc. please let me know. – If you’re in the local media and have questions about this report, the state of the Charlottesville market, why I use numbers only from the Charlottesville area and not outlying counties like Buckingham, Rockingham, Rockbridge, etc. please contact me anytime. – I’d love to do wage analysis and other more detailed analyses, but I have to make a living sometime! – * I was having coffee with a friend last week discussing this report among other things, and mentioned how I didn’t want to write this analysis … she said, “That’s your opening;” so thanks for the help! – The NAR reports that existing home sales are down nationwide; the Census Bureau reports new home sales are down. One possible explanation for higher absorption rate can be that more people are buying outside of the mls at foreclosure sales. I’m assuming you get your stats from the mls vs. the county records. I’ve always enjoyed your analysis. Thanks. I’m a bit of a stat junkie and keep my own reports. Your insights often inspire me to find another angle in an attempt to “catch a clue.” I haven’t looked at entire area, but out of curiousity, I looked at detached homes in Albemarle and the number of homes available vs the age of the home. About 50% of the homes were built in the last 10 years. (Since 1998) 37% of the homes were built in the last 5 years. (Since 2003) There’s really know way to track how many of these have already been sold atleast once since construction, but I think it does tell us people aren’t owning homes as long as I would have guessed. Maybe that’s no surprise, but I found it interesting and thought I would share. I’d love to brainstorm and/or assist in any land analysis you may want to attempt. Its a tough one since most buildable homesites are sold without the use of the MLS. I’d think there’s two ways to look at it. Over 1 acre parcels and under 1 acre parcles. I run in the circles of a lot of builders, developers, and bankers and land values are always a topic of conversation. I think we are experiencing a significant adjustment in new homesite values to keep in line with the single family market. One of the challenges the homebuilders face is what to do with owning dirt that has depreciated. It may have more impact on new starts than declining sales. I definitely feel some activity by people looking to take advantage of interest rates and good deals. I’ve had 4 sales in the last tw0 weeks. One of which was a new construction “presale” on a lot purchased by a builder recently at what I would consider post market adjustment, or what feels like fair market value. Ardell – Thanks so much for the comment; I’m inclined to agree with you to a certain extent, but think that the relatively small number of foreclosures wouldn’t contribute to the spike in months of inventory. From the gut, they might reduce the number of months from 26 to 24 or 23 months – still a long time to burn through existing inventory. Thanks — great analysis. I’m a bottom-line type of guy (I’ll let others crunch the numbers, just give me the data I need to know to make my decision): it looks to me that, while inventories have skyrocketed, the prices have only flattened. I’m looking to relocate to Charlottesville in 2009 and am debating renting vs. buying — has the rental market shown weakness too? I guess the big story of 2009 will be whether prices will continue to hold despite the weakness of the fundamentals (inventory and DOM). If prices continue to hold, as you say, the only reason I can think of would be that the handful of buyers around here are all comatose. Seriously. What else could make prices hold?! Rents are coming down b/c there are so many unsold houses now on the rental market. This is just an observation, not a hard fact, however. But you can verify by watching craigslist. I am also interested in relocating to Charlottesville from South Central Pennsylvania. However, my similar observation to that of TC’s, is that prices continue to remain relatively flat, despite significantly increasing inventories. I have been watching the Charlottesville listings off on and over the past couple of years and continue to be amazed by the prices that the majority of homes are still being listed for (the same applies to my area here in PA). I think that many of sellers have simply not woken up to the new reality of this market. I guess many of them just can’t face having to adjust their home prices SIGNIFICANTLY downward. In my opinion, many of these homes are simply not worth what people are asking for them! You can try to convince me otherwise all you want but when I look at these homes either online or in-person, I frequently say to myself, “You want how much for this place? You’ve gotta to be kidding me!” The homes are simply not affordable!!! I make a pretty decent salary but still find myself amazed that people would even consider handing over $300-500k+ for the types of homes that they are actually getting. That’s why so many homes are not selling. The home prices are still artificially inflated by the go-go years only a short while ago and the prices are not true representations of their current worth. If the homes were priced realistically, then people like myself might bite and take them off the sellers’ hands. I’m not bitter or anything. I just don’t think that many home sellers and their realtors get it. Until they do, a large pool of potential buyers is simply waiting on the sidelines until the moment is right to get into the game or just saving $ by renting. Thanks for the great comment. I think you’re quite right in a lot of respects. Here’s my thought – a lot of sellers have “gotten” that their houses are now worth less, but they simply cannot sell without losing money … from a market perspective, that’s irrelevant, but from a personal finance point of view, that’s difficult to accept. Also, many people do not know what to do if they are under water. From your perspective – no one can convince you (nor should they) that a house is worth X … but since you’re coming to the area I’d encourage you to keep looking. Rent for 6 months to take your time and then use your time and position to negotiate from the position of strength. Get a good buyer’s agent (hint) – analyze the market and, if you’re looking from a long-term position, think about buying. Pricing is but part of the challenge to getting the market moving. Even with houses that are priced well below the comps, buyers have come to expect 10-15% less than that to price in the predicted/expected/hoped for future declines (Nouriel Roubini said recently he expected housing prices to drop 15%, so that’s not a totally unreasonable prediction) … And sellers may not be able to withstand such losses. In all honesty and sincerity, if you have specific questions about the market, please do feel free to contact me anytime. There are 2072 properties active in the Central Virginia MSA. 1 – about half of the sellers right now “get” that their houses are worth what they’re worth. 2 – There are buyers buying right now. I was hoping you might give us your best shot at what 2009 has to offer us in the real estate business? Of the 13.3% you are deriving the “half” of sellers “getting” it. But why are we discounting the other 1796 sellers? To me 50% of the 13.3% is roughly 6.6% of sellers actually “get” that their houses are not worth was they are worth. Maybe I don’t understand the point you are making. That post is coming up in a few days. about half of the sellers currently under contract “get” the market – so, in short, you’re right and thank you, sincerely.